The diplomatic spat over the Aquarius refugee ship carrying 629 African migrants currently heading to Valencia, Spain, shows no sign of abating as Italian Interior Minister Matteo Salvini found an unexpected helping hand in a today released report by charity organization Oxfam who confirmed that French border guards abused, detained and forcibly returned refugee minors and other vulnerable migrants to Italy in violation of EU and French laws. Now, Oxfam’s report called "Nowhere but Out," describes the dire situation of some 16,500 refugees and migrants (a quarter of whom are unaccompanied children) that are often returned by France to Italy using ‘fake’ measures. It stated that French border guards resort to cutting the soles of shoes of child migrants and taking their phone SIM cards. In one horrifying case, a "very young" Eritrean girl was even forced to walk back to Italy on an unpaved road carrying her 40-day-old baby. 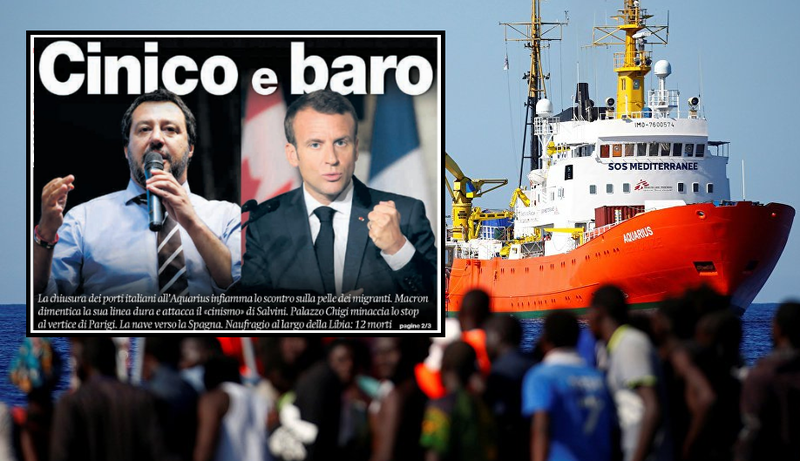 The report confirms Italian Interior Minister Salvini’s allegations that France is not doing its part in matters of European immigration as it systematically returns refugees wanting to cross into France back to Italy. The report stated literally: "Provisions and guarantees are time and again violated, as French officers put children immediately onto a regional train to Ventimiglia.". "In Ventimiglia, there are no arrangements to take care of the returned children. Once off the train, they are left to fend for themselves." European Parliament President Mr Antonio Tajani meanwhile has tried to negotiate a truce between the governments of Italy and France as he warned this week the issue of migration could threaten "the survival" of the 28-nation bloc. Good to see the French acting in the interests of their own people for once. If everyone does what the French border guards are doing then the invasion of EU by the Barbarians will cease!